The Biomedical Careers Program was launched in 1992 to prepare local low- to moderate-income adults for careers in the biotechnology, life sciences, and medical research industries, and supply local employers with work-ready, diverse employees. 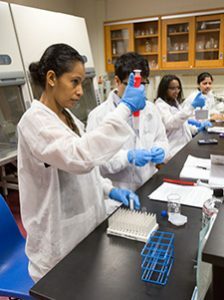 This free, nine-month program provides instruction in biology, chemistry, medical terminology, and computer and laboratory skills. The laboratory training is done in partnership with Bunker Hill Community College. In the program, students also receive job readiness training such as preparing a resume, interviewing, and job search, and are introduced to industry professionals through career talks and employer site visits. After graduation, students receive follow up services for up to one year, until they are placed in relevant employment. 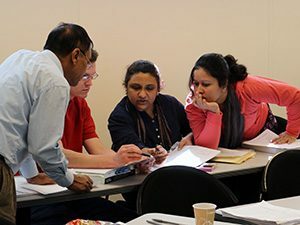 The program is for Metro North residents (priority to Cambridge residents) who have their high school diploma, are eligible to work in the U.S., and meet academic thresholds on adult education exams (TABE). To learn more about the program, please click here to fill out the interest form. Recruitment for our cohort starting in January 2020 will begin in the Fall of 2019. After filling out the interest form you will be contacted when Information Sessions open for our 2020 cohort. The Information Session will provide answers to your questions about the program and instructions for the next step in your application. For additional questions, please contact us at (617) 918-7534 or workforcetraining@justastart.org.